UC physicists are traveling across the country to witness Monday's solar eclipse. Innovation Hub will connect students, faculty, business and nonprofits. Browse our archive of UC Magazine past issues. The staff of Governmental Relations & University Communications, which includes the Academic Health Center office of public relations and communications, is a talented, dedicated group of high-performing professionals, working together to provide consistently excellent public relations and communications services and counsel for the university community. In December 2010, we relaunched the UC Magazine website as a one-stop-shop for university news and features. You will now find far more than just magazine content. The site is designed to connect you with everyday news from UC as well as feature videos, photography, social media streams and many additional ways to explore campus. You can also find archives of UC Magazine issues back to 1999. Our staff of professionals serves as communications consultants, promoting the university and serving as a liaison between the news media and the university community. We are the officially designated office for the university to communicate to the public at large through the mass media. 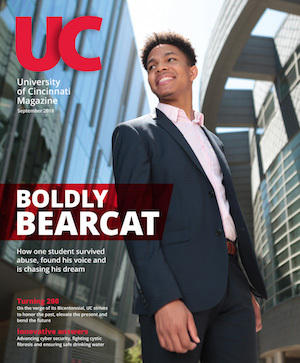 UC Magazine in print is the flagship publication of the University of Cincinnati. It is published in March and October and mailed to donors, friends and full-time faculty and staff. Once strictly an alumni publication, UC Magazine dates back to 1927 when it was called "UC Alumnus." The name changed to "Cincinnati Alumnus" decades later then to "Cincinnati Horizons" in 1972. The name "Horizons" surfaced in the early '80s, and finally it became "UC Magazine" in 2005. Multiple staff members from around campus as well as freelance writers contribute to UC Magazine. To subscribe to UC Magazine, download and print our subscription form (.pdf), then mail it to us along with a $15 check, and you will receive two years of UC Magazine in print. To stop receiving the print magazine, simply sign up for a digital-only version of UC Magazine. Each semester, we offer a paid internship for a UC journalism student. Get more details and apply for our internship opportunity. Change-of-address requests should be sent to Gina.Christensen@UC.edu.